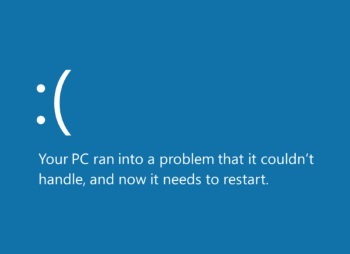 Stop errors (also called blue screen of death BSOD errors) occur when a serious problem causes your system to shut down or restart unexpectedly. You might see the message: "Your PC ran into a problem that it couldn't handle, and now it needs to restart". The most common cause of BSOD errors is a device driver problem. A device driver is a piece of software that works at the interface between the operating system and the hardware. That's why it is a critical piece of software and why outdated, incorrect or corrupt drivers can cause BSOD errors.
" Never download a driver-updating utility ... If you try to update your drivers, you're told that the installed drivers "can cause problems, system slowdowns and blue screen errors" ... The tool wants you to pay $30 a year to "Fix current device driver problems"
Any time you have a problem with your system, if it's still capable, perform a virus check. Also, as indicated above, manually trigger a Windows Update. This error typically occurs after you install new software or hardware and that installation provides faulty drivers or causes a driver conflict. If the error message lists a driver by name, disable, remove, or roll back that driver. If not, use the Windows device manager to uninstall any recently installed driver. When you restart your PC, Windows will detect the new hardware, and allows you to manually install the latest drivers for the device. Other possible causes include system files that have been damaged or removed after you've installed new software or hardware. It can also be caused by a malfunctioning hard disk.